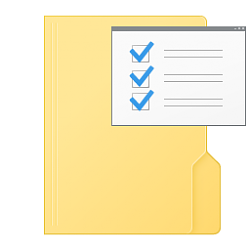 File Explorer can display thumbnail images or icons for files and folders in Windows 10. This tutorial will show you how to enable or disable thumbnail previews in File Explorer for your account, all users, or specific users in Windows 10. Thumbnail previews will only show when turned on and you have a medium icons, large icons, or extra large icons folder view layout selected. If thumbnail previews is turned off or disabled, it will also disable previews of files in the preview pane. If you choose a file to show as a folder picture, this folder will no longer show a thumbnail preview of its content until you restore the default folder pictures. If you change the icon of a folder, this folder will no longer show a folder picture or thumbnail preview. This option will only affect your user account, and does the same as Option Two and Option Three. Option Four and Option Five will override this option. A) Click/tap on the View tab, uncheck Always show icons, never thumbnails, check Display file icon on thumbnails, and click/tap on OK.
A) Click/tap on the View tab, check Always show icons, never thumbnails, and click/tap on OK. This option will only affect your user account, and does the same as Option One and Option Three. 1. Open Visual Effects settings. A) Check Show thumbnails instead of icons, and click/tap on OK.
A) Uncheck Show thumbnails instead of icons, and click/tap on OK. This option will only affect your user account, and does the same as Option One and Option Two. The .bat files below will modify the DWORD value in the registry key below. 6. Run the .bat file. 7. You will now notice your screen flicker and a command prompt quickly opens and closes as explorer is restarted to apply the registry changes. 8. When finished, you can delete the downloaded .bat file if you like. This option will affect all users or specified users, and does the same as Option Five below. This option will override what users have set in Option One, Option Two, or Option Three above. This option is not available in the Windows 10 Home edition since the Local Group Policy Editor is only available in Windows 10 Pro, Enterprise, and Education editions. All editions can use Option Four below. B) Users will now be able to turn on/off thumbnail previews using Option One, Option Two, or Option Three above. This option does the same as Option Four above, but only is applied to the current user. This option will override what you have set in Option One, Option Two, or Option Three above. 7. Sign out and sign in, or restart the computer to apply. 9. If enabled, users will now be able to turn on/off thumbnail previews using Option One, Option Two, or Option Three above. Anyway, I'm just wondering what the next step to deal with the situation would be. If you have Windows 10 Home edition installed, then you will not have the Local Group Policy Editor (gpedit.msc) available. It's only available in Pro and Enterprise editions. If you like, you can use OPTION FIVE instead to apply the group policy. I'm sorry to hear that. If you like, download and merge the .reg files of your affected file types (ex: mpeg and avi) listed in the table of OPTION TWO in the tutorial below to see if it may help. It'll restore the default associations of these file types. Goodday, I want to ask if any of you knows how to just shows the thumbnail of files e.g. photos and videos but not the folders. I mean folders, generally, stay as icon only, no preview of whats in it. Thank you guys in advance!